A Dance for ALL Ages! Open to all island children and their parents. Begins on West Clinton Avenue. No motorized scooters, bikes, etc., please. Followed by an Ice Cream Social under the tent. Unleash your creativity! Campground artists lead this activity. Materials will be provided. $40 for adults; children under 12 $25. Three teachers from Built on Stilts will be offering a free hour of creative movement and dance games for 3-5 year olds. No parental supervision necessary. 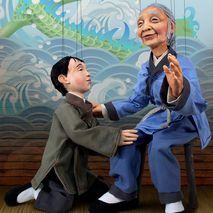 Tanglewood Marionettes "The Dragon King"
This talented troupe provides an opportunity to go behind the scenes after the show, answering questions and giving an up-close look at the puppets used in the show. A favorite for all ages! Free will offering. A summer family favorite for children, parents and grandparents, join us for games, face painting, crafts, goodies and more! A special presentation of the attire and etiquette of the 1860s. Q&A following her presentation. Free will offering. Enter your own art work or just come enjoy the beauty and creativity of all island children artists. Limited space so advance sign-up required. On-line registration available at allislandartshow.wordpress.com. Rain date: Thursday, August 10th. Always a summer highlight, the Tabernacle Summer Theatre presents Rogers and Hammerstein's "Cinderella". Paint your own paper lantern for Grand Illumination Night! Sign-up in advance at the office. Sessions at 10:00am and 1:00pm. Fee is $15 which includes all supplies and instruction. Sessions are led by Nancy Blank (event founder!) and Marrietta Cleasy (campground artist).